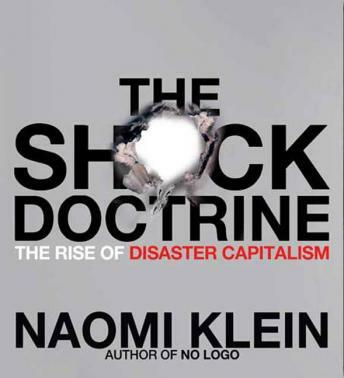 Listen to "The Shock Doctrine: The Rise of Disaster Capitalism" on your iOS and Android device. In her ground-breaking reporting Naomi Klein introduced the term 'disaster capitalism.' Whether covering Baghdad after the U.S. occupation, Sri Lanka in the wake of the tsunami, or New Orleans post-Katrina, she witnessed something remarkably similar. People still reeling from catastrophe were being hit again, this time with economic 'shock treatment', losing their land and homes to rapid-fire corporate makeovers. The Shock Doctrine retells the story of the most dominant ideology of our time, Milton Friedman's free market economic revolution. In contrast to the popular myth of this movement's peaceful global victory, Klein shows how it has exploited moments of shock and extreme violence in order to implement its economic policies in so many parts of the world from Latin America and Eastern Europe to South Africa, Russia and Iraq. This book is a real eye opener. It gives a time line, and shows how many things that are often over looked are connected. It feels like a true life compilation of the philosophies of Ayn Rand's Atlas Shrugged and the Communist Manifesto by Karl Marx. Makes one think of what shall become of us as a people. This was a very informative book. It really brings out the dishonesty of our government. More people should read this book. This is a book written with an agenda. Basically, if you're a Democrat you can do no wrong, if you're a Republican you do nothing but wrong. The author does make some points, and it's not a bad story. The problem is that it's so one-sided that it's impossible to gain any kind of objective information from it. It's too bad, because I'm very interested in the subject matter. I just didn't feel I could trust anything here, and I only made it half way through the book before I gave up. If you lean to the left you'll love this book. If you lean to the right, or want to get a factual information showing both sides of the issues you won't get much from it.